The Children’s Play Area is well used on a daily basis. 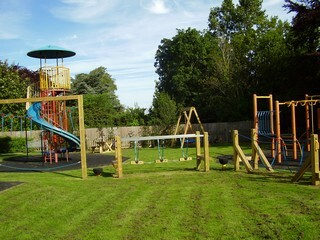 It is equipped with various types of swings, a slide, zip wire, climbing frames, an agility trail and toddler rides. Recently four pieces of adult exercise equipment were installed allowing adults to exercise while their children are playing. Picnic tables are located within the area and there is a nearby BBQ. 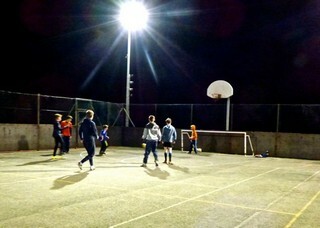 There are two full size football pitches used by Porlock Football Club but also used by local families at various times throughout the week. Each spring the pitches are used as part of the ESF Festival of Football tournament. 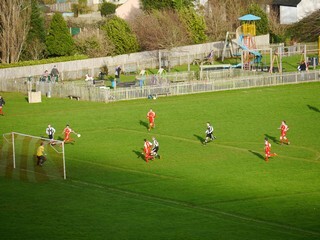 Porlock FC was founded in 1887 and has 2 teams, affiliated to Somerset FA, who compete in Divisions 1 & 3 of the Taunton and District Saturday League. The Football Club fixtures are posted weekly on the Club notice board next to Pollard’s Garage. The floodlit tennis court was resurfaced in 2015 and is a free to use resource. The multisport games court, also floodlit and free to use, has markings for 5 a side football, basketball, hockey and netball. Porlock and District Bowling Club is situated by the Recreation Ground and has a County standard rink and a clubhouse with a bar and a short mat bowling facility for out of season use. The club has a reputation for its friendly welcome to visiting teams as well as the casual visitor. Always keen to attract new members, free coaching sessions, supervised by the club's two qualified coaches, are held at 2.00pm on Tuesdays during the season with all equipment provided. Porlock Cricket Club maintains the cricket square which sees regular use during the summer months. All dogs are to be kept on leads while on the main Recreation Ground. At the southern end of the Recreation Ground there is a sizeable dog exercise area where dogs are welcome to run free. Dog owners are requested to pick up all dog mess. The main pavilion features a meeting/function room, kitchen, changing rooms and showers as well as disabled toilets and baby changing facilities. The pavilion is used throughout the year on an occasional or regular basis by groups including Porlock Toddler Group and Exmoor Adventures. Many children's parties are also held there and the close proximity of the children’s playground is an added bonus. Please contact the Clubs directly for further information. New members are always welcome. Queries about the facilities should be sent to us using the contact page.